What would you do for a Red Bull? 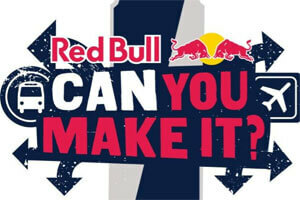 Or, more appropriately, what would you do for a “once-in-a-lifetime” adventure in Europe courtesy of Red Bull? For Joe Serpico and two of his friends – his roommate, Aaron Lotter, and Lotter’s girlfriend, Jessica Rose – the answer was simple. They’d make a video showing their love for not only the popular energy drink but NIU as well. Dubbing their team Molly’s Bus, they filmed in Founders Memorial Library, outside Altgeld Hall, atop the front gates at Castle Drive and West Lincoln Highway, on a hockey rink, in Chicago and in an apartment featuring plenty of Huskie gear. Their ultimate prize – had their one-minute video earned enough online votes to become a finalist in the Red Bull “Can You Make It?” competition – would have taken the trio to Europe, where they would have no phones and no money but some Red Bull to barter for common comforts. Serpico and his friends heard about the competition from Rose’s sorority sister, Kenzie Baird, who’s a Red Bull representative. When they brainstormed for a concept, they settled on an elaborate game of keep-away – and plenty of creative ways to accomplish that. Two other NIU teams also were in the running: Midwest Mammals, consisting of Patrick Birk, Cameron Jackson and Sam Rorie; and the Chicago Red Bulls, consisting of Dan Dillet, Dylan Luzbetak and Tyus Tuialii. Although Molly’s Bus and the others didn’t make the finals, Serpico hopes fellow Huskies will grab their video cameras and enter the competition next year.